54 MMS January 2017 mmsonline.com SHOP TALK NIMS is seeking companies and education a nd ind u str y pa r tn e r s th at a re inte re ste d in enhancing their talent pipelines through appren- ticeships. For more information on building an apprenticeship program or partnering with NIMS, visit mfgapprenticeship.com or email the NIMS Apprenticeship USA team at apprenticeship@ nims-skills.org . NIMS, call 703-352-4971 or visit nims-skills.org. SMARTCAMCNC, MODULEWORKS ANNOUNCE LICENSING AGREEMENT SmartCAMcnc, devel- oper of the SmartCAM software suite for CNC programming, has made a licensing agreement with ModuleWorks for the integration of the lat- ter's simulation technol- o g y m o d u l e i n to t h e former's CAM software products, specifically SmartCAM v2017. Mod- uleWorks' stock removal, error detection, toolpath analysis and backplot- ting technology replaces S m a r t CA M's c u r r e n t verification tools. " C u s t o m e r s w i l l i m m e d i a t e l y b e n e f i t from the new, integrated ModuleWorks material r e m o v a l v e r i f i c a t i o n e n g i n e ," s a y s D o u g Oliver, SmartCAMcnc's senior product manager. ModuleWorks GmbH, call 49 241 990004-0 or visit moduleworks.com. SmartCAMcnc, call 541-344-4563 or visit smartcamcnc.com. Cole Carbide Industries, Inc. World Headquarters 4930 S. Lapeer Rd. 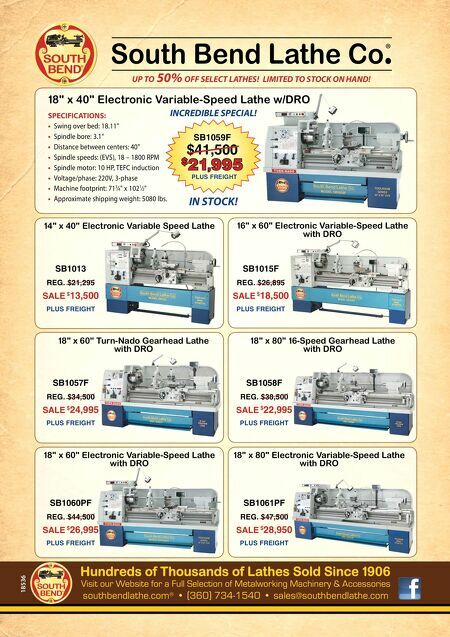 • Orion Twp., MI 48359 • U.S.A. Tel: 586.757.8700 • Fax: 586-757-8701 • www.colecarbide.com Cole Carbide celebrates 80 years of excellence as a leading provider of cutting tool solutions and systems. Four generations of the Cole family have carried Cole Carbide's vision, serving clients with a commitment to family values, product innovation and quality assurance. Today, Cole continues to impress, expanding their reach as a globally integrated, locally serving company that satisfies diverse needs. From John Cole and the rest of the Cole "family" we thank you and look forward to serving you in the years to come. 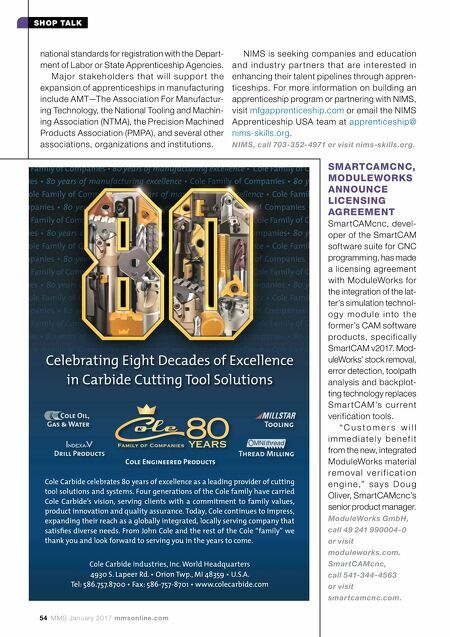 Celebrating Eight Decades of Excellence in Carbide Cutting Tool Solutions national standards for registration with the Depart- ment of Labor or State Apprenticeship Agencies. M a j o r s t a ke h o l d e r s th at w i l l s u p p o r t th e expansion of apprenticeships in manufacturing include AMT—The Association For Manufactur- ing Technology, the National Tooling and Machin- ing Association (NTMA), the Precision Machined Products Association (PMPA), and several other associations, organizations and institutions.